SÃO PAULO, BRAZIL – Two major confidence indicators released in Brazil this week by the Getulio Vargas Foundation (FGV) show improvement in expectations, although both indexes remain in negative territory. The Trade Confidence Survey (ICOM in Portuguese) increased by 1.5 points while the Consumer Confidence Index (CCI) rose by 1.8 percent, reaching the highest level since December 2014. Despite sales consumers are still cautious when it comes to purchases, photo courtesy of Agencia Brasil. “Despite the continuing downward trend of the labor market, the prospects of slowing inflation and falling interest rates appear to contribute to less pessimistic forecasts regarding purchases of durable goods in the short term,” said Viviane Bittencourt, FGV’s Consumer Survey Coordinator said in her report of the results. 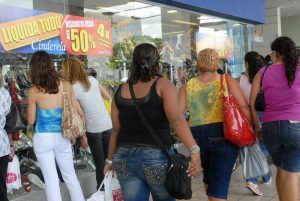 The Consumer Confidence Index (CCI) of the Getulio Vargas Foundation rose by 1.8 point in October, reaching 82.4 points. After six consecutive increases, the index reached 82.4 points the highest level in almost two years. The institution’s Trade Confidence Survey (ICOM) rose by 1.5 points to 81.9 in October almost making up for the 1.7-point decline seen in the September index. Nonetheless, the index, which ranges from zero to two hundred, continues below the one hundred mark, remaining in negative territory. According to Aloisio Campelo Jr., Superintendent of Public Statistics at FGV, the low level of the index reflects the sector’s performance whose sales continue to decline, although at a slower rate. As for future expectations Campelo says the sector still has doubts about the speed of recovery of household consumption. An index which measures the intention of household consumption (ICF in Portuguese) released this week by the National Trade Confederation (CNC) also shows consumers remain cautious as to future purchases. The index rose by 2.4 percent to 73.9 points in October in comparison to September, but remains below one hundred points, a pessimism indicator.